I am the The Pacific Sand Crab, also known as the Mole Crab, a staple of the southern California beach goers experience. I am most frequently found on tidal sandy stretches of warm and sunny summertime beaches. I am quick to burrow to evade birds (Sandpipers, scooters and plovers) and fish (surfperch, corbina and small sharks) that key in on me as a food source. Humans with a quick hand have a shot at capturing me for amature science observation. A common sight on the beaches of San Diego County are inquisitive children armed with nothing more than plastic buckets and a sense of curiosity hunting me in the backwash of retreating waves. As my name suggests, Sand Crabs, prefer open sandy areas where we are free to move with the ebb and flow of tides. As waves break onto shore they bring with them plankton and detritus* which I filter from the water and utilize as a food source. Those trying to capture me are able to identify my location by looking for subtle clues along the beach. As the receding wave moves back to the ocean my antene make a distinctive V shape in the outflowing water. Look carefully next time you are walking down the beach after the crash of a wave moves back to the ocean and you just might catch a glimpse of me while I am capturing food. Why should humans care about me? Sand Crabs are known as an indicator species that can highlight poor environmental health in coastal ecosystems. In particular San Crabs, as abundant filter feeders, can tell us a lot about the diatoms that can cause toxic algal blooms* which at times close beaches in southern California. Algal blooms, which will be covered in a future Get to Know Your Neighbor Segment, are linked with the runoff of fertilizers used by humans. 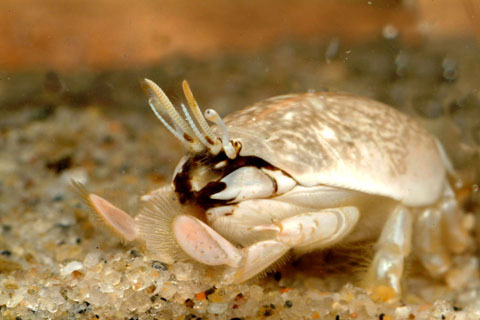 In essence, Sand Crab abundance helps scientists to understand ecosystem health at larger scales. 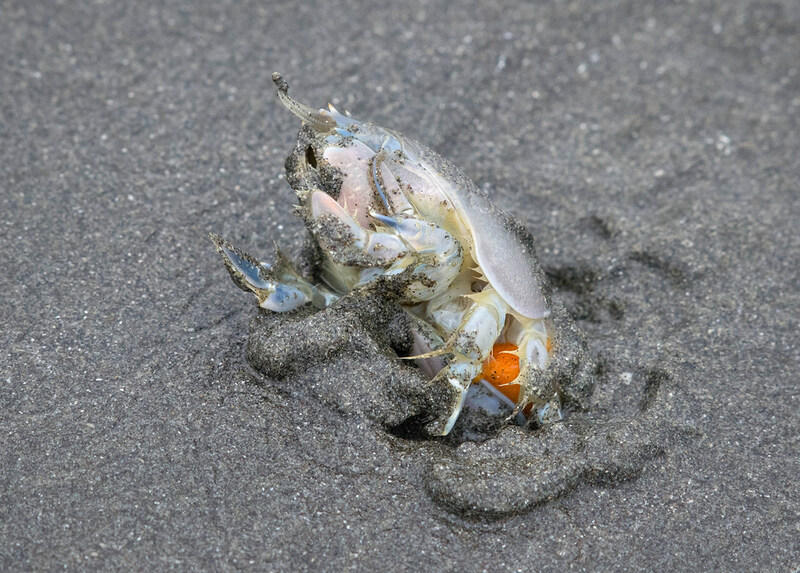 Sand Crabs also provide a valuable food source to predators which rely on them to convert plankton and detritus into usable energy for organisms higher in the food chain. If you would like to help in the conservation of my species there are ample volunteer opportunities with WILDCOAST to help clean up beaches and collect data on Marine Protected Areas in San Diego County. Contact cory@wildcoast.net for more info on how to get involved. WILDCOAST will be taking part in the RH Fleet Science Center’s 52 weeks of science initiative on Wednesday January 11th, 2017 at Iron Fist Brewing in Barrio Logan from 6:30pm – 8:00pm. Conversations of Marine Biology featuring WILDCOAST is a 21 and up event where specialist in local marine biology enjoy a beer and talk shop at a local brewery. Join us to listen in on their conversation and feel free to interject when the discussion starts to go over your head. The panel with then work together to find a more accessible way to explain the subject matter. *Toxic Algal Blooms- An event which has been linked to human use of fertilizer whereby large blooms of algae create harmful naturally occurring toxins in mass quantities that negatively impact other species. Photo by Ingrid Taylar. 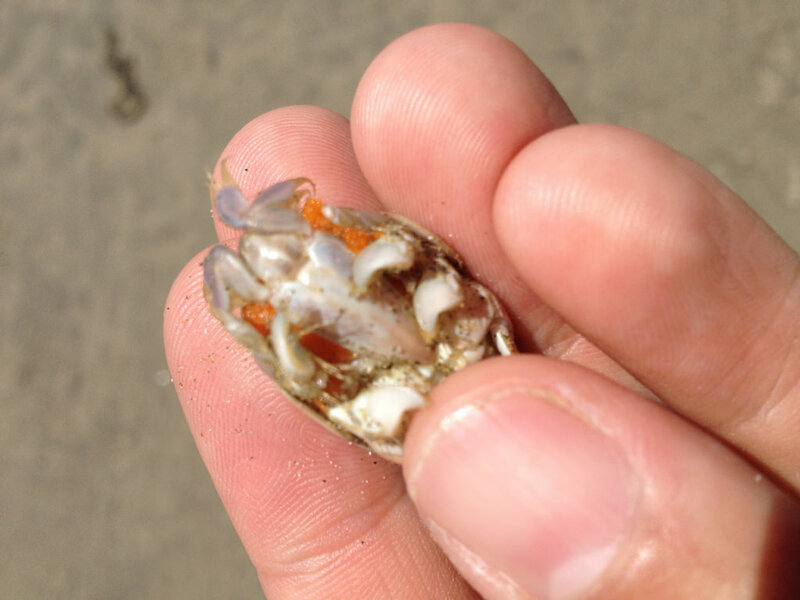 This Pacific Mole Crab (sand crab) is female based on the bright orange egg sac pictured here.